Welcome to the new video series, “How to Build a Breakthrough Brand.” These 10 short sessions – each comprised of a 3-4 minute video and downloadable worksheet — are designed to introduce you to the fundamentals of brand-building. And, they’re FREE – no fee, no sales pitch, no email sign-up required, just FREE! 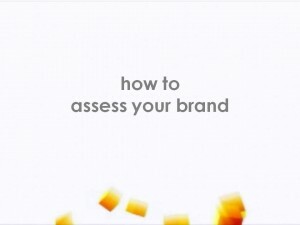 Earlier this week, I showed you “How to Do a Brand Diagnostic.” Today’s video, “How to Assess Your Brand,” covers the 10 criteria you should use to evaluate your current brand power and performance. Next week’s videos include “How to Clarify Your Brand Essence” and “How to Position Your Brand.” With these two topics under your belt, you’ll be able to develop a focused and differentiated strategic platform for your brand. Be sure to subscribe to my blog feed so you don’t miss them. Please let me know your feedback and questions and, if you want more insights and instruction, subscribe to my brand-as-business briefs™(tm), periodic emailed briefings about how to operationalize your brand to grow your business.